Ok, so it is only famous to my old coworkers, but that has to count for something. Right? 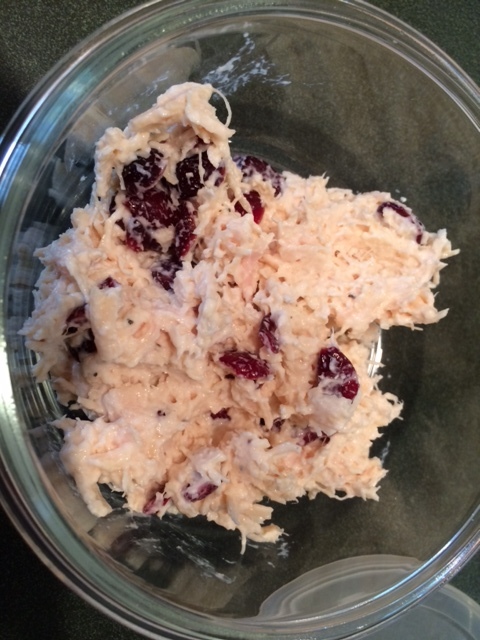 I have seen chicken salad made so many different ways, and they always consisted of celery. Well, I hate celery and pretty much everything else, so I made my own creation. Honestly, I don’t know where I got the idea to put lemon juice in it, but it happened. It’s a beautiful thing. This is the perfect dish for a potluck, and that is where it became famous for me. It is still being made at the Allied DC (shout out!) potlucks even though I don’t work there anymore. I like to eat this 2 ways, with Wheat Thins or Pretzel Crisps. You can eat it however you like, but I definitely recommend trying it with those two items. Below is the recipe. Put all contents above in a bowl and mix. DONE! All ingredients above are based on your own taste and how much you want to make. I made enough for 2 lunches and used 3 tiny cans of chicken (I thought they were bigger, I am a bad shopper). This is a super easy recipe and it is very good. Stuffed cabbage was always a favorite meal in our house growing up, especially in the winter. It is definitely a Sunday meal, because it takes a bit of time to cook. I always ate the inside, never the cabbage. This time, I decided I should at least give the cabbage a chance. Surprisingly, I liked it. Don’t expect me to eat a lot of it though, I didn’t like it that much! 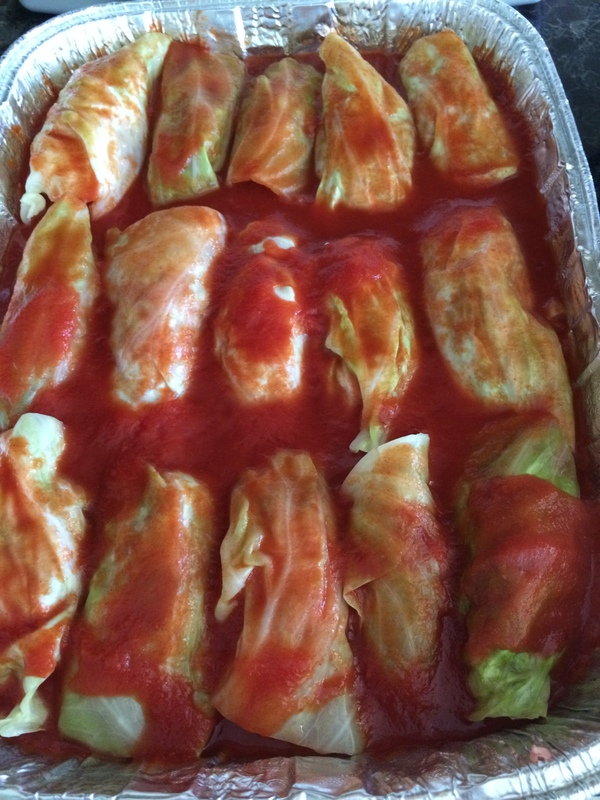 Below is our family recipe for Stuffed Cabbage. 1 package of ground beef and/or pork. Some people mix the beef and the pork together. Par boil cabbage with 1 tablespoon of corn starch. Cook rice and mix with beef. Roll the cabbage leaf around the beef/rice mixture. Put eat roll in oven pan and pour the sauce mixture over. Bake on 350 for 1 hour. Mashed potatoes are a great side for this dish and this makes quite a bit of rolls, so you can definitely have leftovers! It is a pretty easy meal to prep and once it is in the oven you can just sit back and relax. Last night’s dinner turned into more than I expected. I had pulled out chicken in the morning with every intent on just baking it, putting it on some old Jimmy Johns bread and calling it a day. What happened when I got home, turned into a really delicious dinner. I had the chicken defrosting in the fridge all day, so when I got home I stuck it in a ziplock bag and marinated it for a few minutes in honey mustard dressing. I then stuck it in the oven for 33 mins (I know very random number) on 350 degrees. At about 15 minutes into the baking, I decided to make some spaghetti. I am not a huge fan of red sauce, so I was just going to add a little butter to it. Well, I concocted something a little different. I didn’t measure anything out and just kind of threw everything in to my taste liking. I mixed it all around and what I ended up with was pretty delicious. It gave it a little different taste than normal and it actually complimented my chicken nicely. I have seen some recipes use olive oil instead of butter, but I didn’t have any of that handy. It was quick to just throw in ingredients I had in the house. You could also add garlic, if you are into that sort of thing. 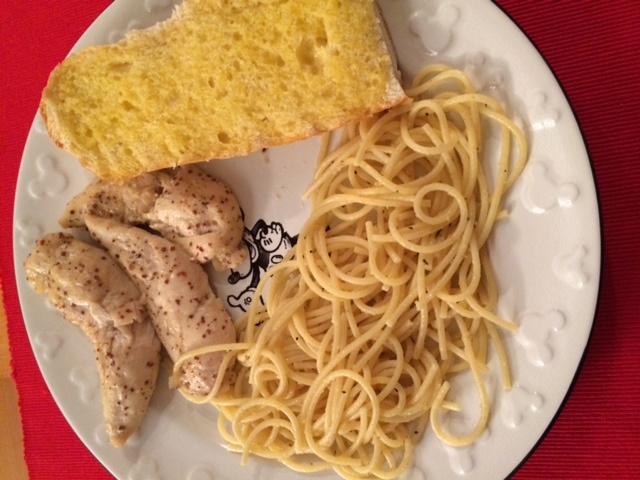 Instead of putting the chicken on the Jimmy bread, I made garlic bread in the oven with it! I realize there aren’t any vegetables on this dish, but I promise I ate a lot of vegetables at lunch (even some I just tried for the first time on Monday). All in all, this meal took 33 minutes to make! I actually timed everything perfectly for a change! Nice and quick weekday meal, and of course I have some leftovers for lunch tomorrow (major bonus)! 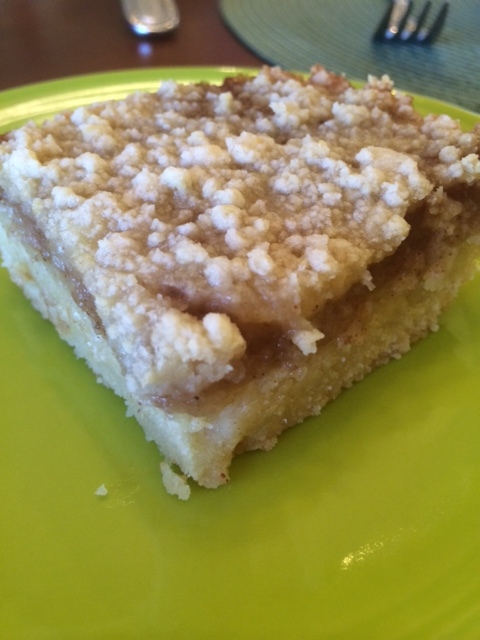 In honor of St. Patrick’s Day on Monday, I give you the very delicious Irish Apple Cake. It was actually super easy to make and between my mom’s pantry and my pantry, I didn’t have to go out and buy any ingredients. Basically, that is a win in itself! I guess since I used some of her ingredients, I should share the finished product. They said it was very good, so that means you all should try it! 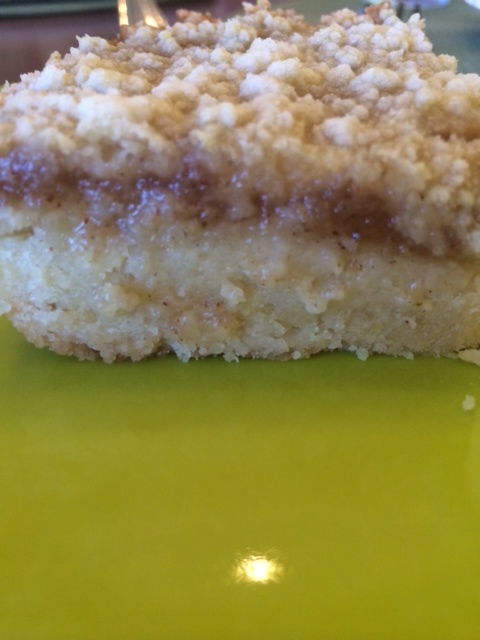 It has a bit of a shortbread taste to it and that is a great combination with applesauce. I recommend serving it warm and maybe with some ice cream. I got this recipe off of allrecipes.com. Makes 1 9×9-inch cake. I used an 8×8 pan and it worked out just fine. Mix flour, sugar, and salt together in a bowl. Beat in egg yolks, butter, and lemon zest until dough is thoroughly mixed. It will be crumbly. Mix applesauce, cinnamon, and cloves together in a small bowl. Press half the dough into the prepared baking pan; spread applesauce mixture over dough in a layer. 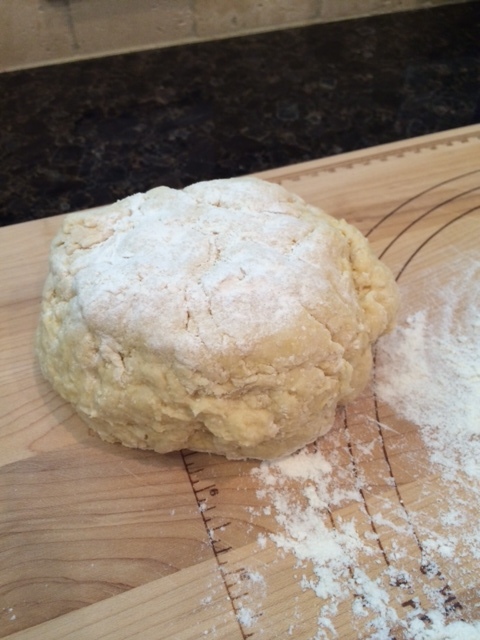 Top with remaining dough. Bake in the preheated oven until cake is browned, 40 to 45 minutes. 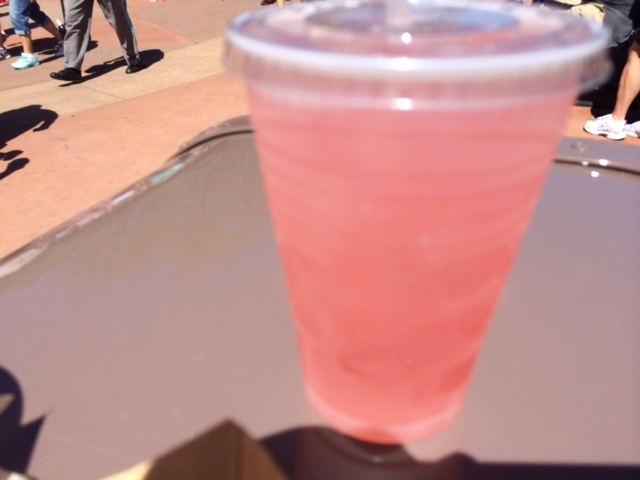 I also had the Chilled Rose Blush Lemonade featuring Simply Lemonade with Raspberry. This was so refreshing and you actually got a pretty good size for the price. I loved every moment of this lemonade. Next up, and my favorite of all. I headed to Japan for some Frushi! 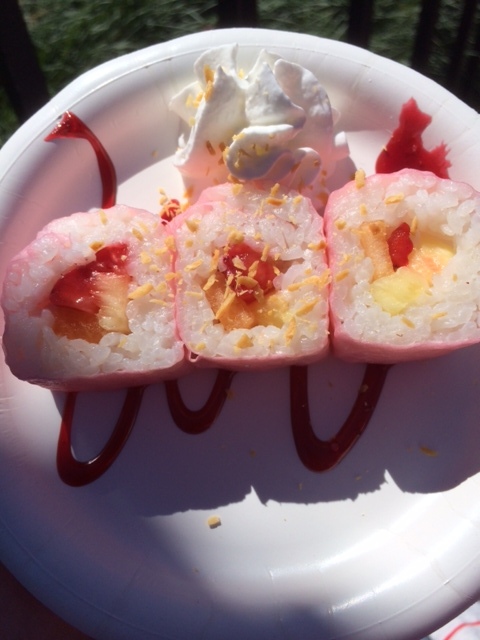 It is fresh seasonal fruit (pineapple, strawberries, and cantaloupe) rolled with coconut rice, served with raspberry sauce and sprinkled with toasted coconut with whipped cream on the side. I tried it last year and it was a must have this year. It is the most amazing sushi I have ever had, mostly because it’s not made of fish! It is fruit wrapped up in rice, 2 of my favorite things! 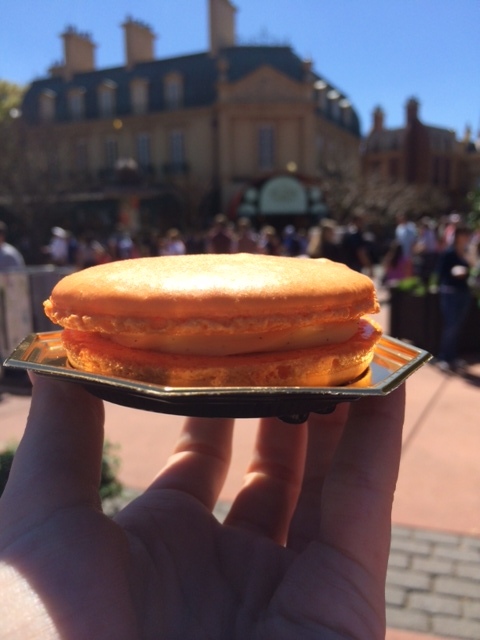 I found a recipe on the Disney Food Blog so if you want to try at home, you can. 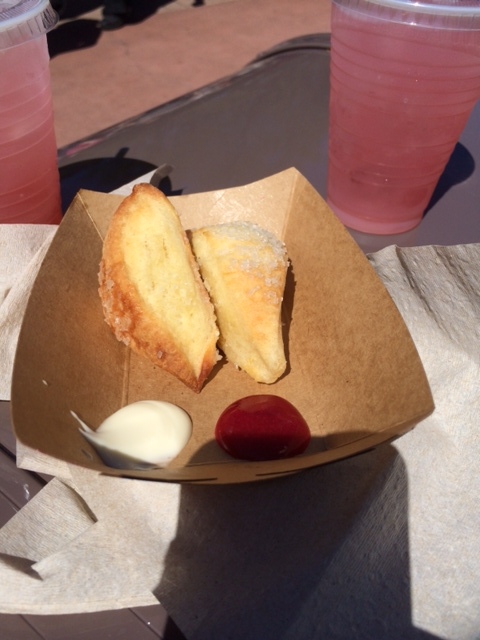 If anyone is traveling to Disney before May 18th, you should definitely check out the Home & Garden Festival at Epcot. It is a must see! Knead approx. 10 minutes, roll into a ball and let set for at least 10 minutes. Roll dough between hands to form a long link (like kielbasa) Cut in slices and roll out with either rolling pin or just stretch with your hands. 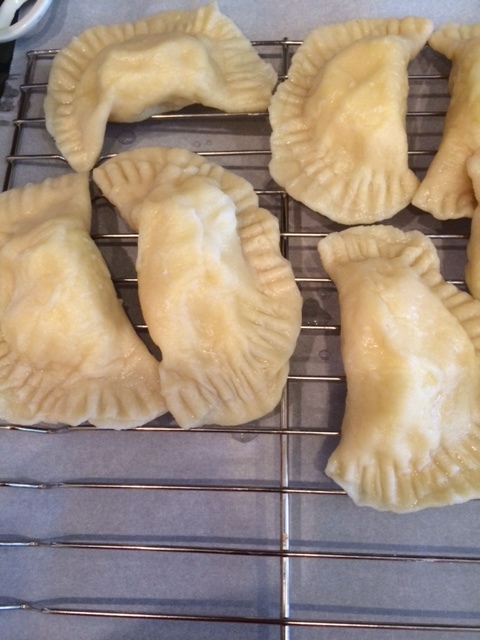 Fill dough with potato mixture and press edges until sealed. You can use a fork. You can put them in ziplock bags and put in freezer. 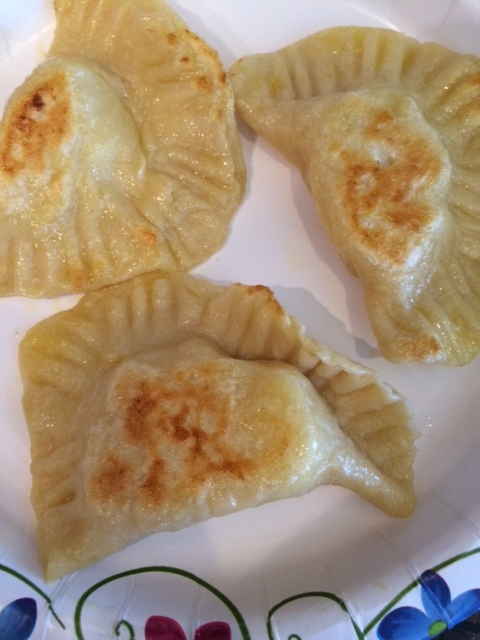 Make sure to put some butter in the ziplock bag with the Pierogies before freezing. Once you are ready to eat them, stick them in a frying pan with butter until they are a little golden brown. Enjoy! You won’t be disappointed, they are so good! !